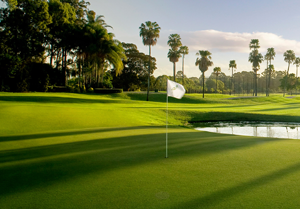 As Australia’s only Arnold Palmer signature course, The Pines golf course is recognised as one of Australia’s best and most challenging courses. Ranked as one of Australian Golf Digest’s Top golf courses, The Pines is carved through 101 hectares of established pine forest, the course features corridor approaches to several holes, with lakes guarding others. Fourteen of the holes are contoured around six man-made lakes. An abundance of wildlife features on The Pines including rare bird life and scores of native Australian kangaroos. With a course rating of 74 off the black tees and 72 off the blue tees the course offers a very special golfing experience. In the Australian Golf Digest’s recent Top 100 Australian Golf Course rankings, The Pines golf course came in at number 45. Please review our Dress Regulations before visiting.